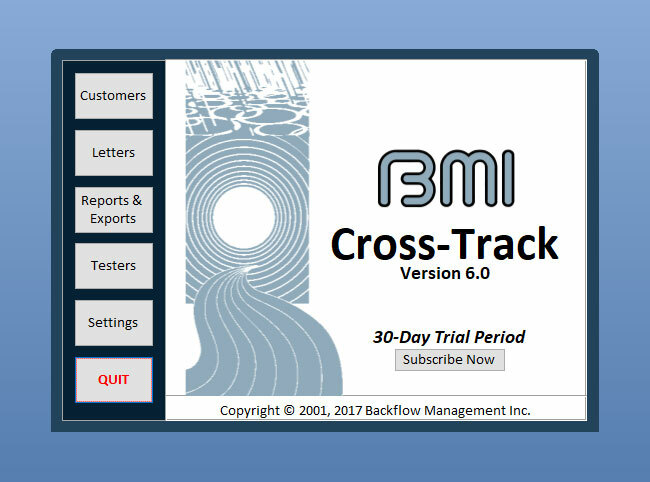 BMI Cross-Track 6 for Water Systems is an easy to use software product that manages your entire backflow testing and cross connection control program. This program comes in all sizes from 25 service connections to an unlimited number of service connections. NEW Program levels designed for smaller water systems. The option to customize letters and add your header, footer, logo and wording! BMI's Cross-Track Pricing is a one time payment and is based on the number of customer accounts. Call for current pricing. Already own a previous version of BMI's Cross-Track? Tell us and get special upgrade pricing!